The myth that the United States is a “nation of immigrants” feeds into the national self-image that the United States is both a free society and a land of opportunity. It is a seductive myth because we cherish the well-established fable of American exceptionalism, and the idea that this nation is “a city set upon a hill.” But the myth is more fiction than fact, and it hides a deeper and deeply unsettling truth about our nation’s past and present. We need to stop saying that we are a “nation of immigrants.” The following article explains why. The Naturalization Act of 1790 was the first US citizenship act. It limited naturalization to free white citizens, thus excluding Native Americans, slaves, indentured servants, Asians and many others. During the following decades and centuries other naturalization laws were enacted, but it was not until 1924 that the Indian Citizenship Act was enacted. Adam Goodman’s article, “A Nation of Immigrants,” which appeared in the October 8, 2015 issue of Dissent Magazine traces the nation of immigrants paradigm to the Chicago School of Sociology in the early twentieth century. Goodman says that the paradigm gave European immigrants a privileged place in US society, and allowed them to treat non-European immigrants as secondary actors, while ignoring Native Americans completely. The big change came in immigration policy came with the enactment of the 1965 Immigration Act. This Act ended the national-origins quota immigration system that had prevailed up until then, and created new opportunities for people from around the world to come to the United States. The number of immigrants as a percentage of the total population nearly tripled between 1970 and 2015, growing from less than five percent to nearly fourteen percent. 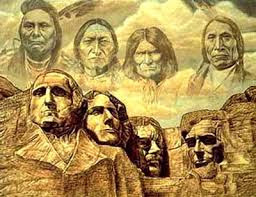 The nation of immigrants mythology emerged during this period. Importantly, the “nation of immigrants” myth fed into the flawed “Bering Straits” theory of indigenous migration from Asia to the Americas some 12,000 years ago. Accordingly, Indians were the first immigrants. The Anglo settlers and others who came later were simply subsequent waves of immigrants coming in search of a better life. Historian Roxanne Dunbar-Ortiz debunked this “Bering Straits” theory. She argues that indigenous peoples were in the Americas at least 50,000 years before the English and other European settlers arrived. Recognition of this history is not permitted by the "nation of immigrants" myth. The plain truth is Native Peoples were dispossessed of their land. No president better embodies the federal government's irregular warfare against Native Americans than Andrew Jackson. It is not reassuring that President Trump has moved a statue of Jackson into the Oval Office. In contrast to Jackson Era policies, the Indian Restoration Act of 1934 created a framework for a measure of Native American self-governance. But many issues remained unresolved. After World War II the federal government turned away from policies supporting Native Peoples and turned toward policies that it believed would lead to the elimination of Native Peoples. Congress adopted House Concurrent Resolution 108, the Termination Act, on August 1, 1953. The stated purpose of the Termination Act was "free those tribes listed from Federal supervision and control." The termination policy meant that federal trust protection and transfer payments guaranteed by treaties and other agreements would end. That same year, 1953, Congress enacted Public Law 280, which transferred all tribal court jurisdiction to respective state courts. As a result of these acts of Congress, 109 tribes were terminated, approximately 2.5 million acres of Indian trust land was removed from protected status and sold to whites, 12,000 Native Americans lost tribal recognition, and tribal governments lost their right to govern. The termination policy was not ended until 1968. Tribes and individuals harmed by the termination policy have not been made whole for the loss they suffered or fully compensated for the damages caused by the government’s action. The myth that the United States is a “nation of immigrants” hides the history of our nation’s anti-Indianism while promoting the notion that this is a land of opportunity founded and built by immigrants. Since many Christian denominations have repudiated the doctrine of discovery they can now take the next step and renounce the nation of immigration myth. This will help clear the way to advance much needed conversations calling for respect of the almost 400 treaties that the United States has with Native nations, ensure protection of Native lands, lend support to the Native American drive for self-governance. The United States is not a "nation of immigrants." It is a settler nation trying to discover its identity and redeem itself.